Is India's premier news agency PTI in a race to the bottom? According to insiders, because of the deterioration in service, PTI has lost and is losing subscribers, instead of attracting any new ones. Bizarre it may seem but it is a fact. The Press Trust of India (PTI) news agency, which retrenched 297 staffers some months back with one go, took a huge loan of Rs.40.15 crores for the purpose. And the loan amount will have to be repaid with the interest rate of 10.5 percent. This amount was borrowed from the banks for payment towards retrenchment compensation and one month’s notice and Tax Deduction at Source (TDS) amount of Rs.8.63 crores. The union leaders ask how PTI has turned into a loss-making company from a profit-making company. 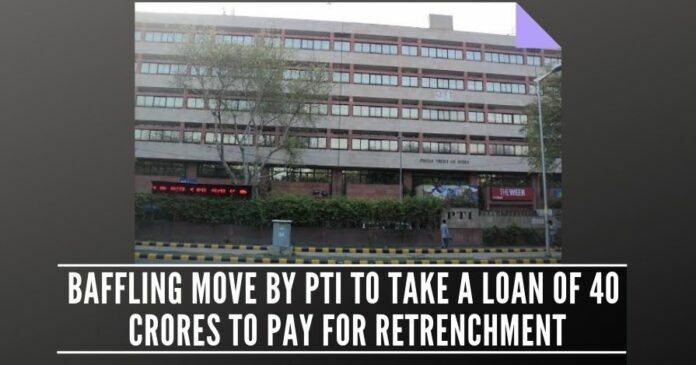 The PTI management retrenched 297 wage board staffers in September last year in one go. The staffers were hit by a shock with the sudden announcement. Such was the trauma that many of the staffers were told about their retrenchment when they arrived in office routinely for their duties. The PTI union has challenged the decision in the Delhi High Court. A single bench of the High Court quashed the retrenchment order but the management then challenged it in a double bench. The double bench set aside the single bench order and the matter is now being heard. The PTI union says it was absolutely unnecessary to take such a big financial liability by a company whose turnover is not in thousands of crores. In addition, more than 60 percent of the retrenched staff would retire in a few years. The management has argued that the retrenchment became necessary because of operational losses suffered by the company. The union leaders ask why PTI, which is a premier news agency of the country and has dominated the news content market for decades, has come to a situation where it is facing financial difficulties. The union leaders ask how PTI has turned into a loss-making company from a profit-making company. They ask if it is because of the sharp decline in PTI’s quality of service since 2017 after Vijay Joshi took over as Editor-in-Chief. According to insiders, because of the deterioration in service, PTI has lost and is losing subscribers, instead of attracting any new ones. PTI lost two major media groups as subscribers since November 2017, which cost the company nearly Rs.2 crores annually, according to the insiders. Many other subscribers are also said to be unhappy over the deterioration in PTI service. Insiders say there have been even written complaints and warnings by subscribers that they are not happy with the content now. According to the insiders, it is happening because of the failure of editorial leadership. PTI was also caught for many times for fake news peddling too. After all, news content is the core business of PTI and if the quality of its core service is deteriorating, the editorial leadership is to be held responsible. It may be noted that the editorial leadership changed in PTI in February 2017 when Vijay Joshi took over as Editor-in-Chief. Soon after, blunders, mistakes and delayed delivery of stories have become the order of the day in PTI service. This has hurt PTI’s credibility badly. The union leaders say that if the editorial leadership is to blame for PTI’s reducing revenues, why were the small-time employees like attenders and IT people sacked? The wage board employees, who served PTI for years and decades, were sacked without any mandatory notice. The sacking was so abrupt that many of them could not even retrieve their belongings in the office lockers as their access to the office was terminated immediately. Something is rotten in India’s premier news agency Press Trust of India. Previous articleWhy are RaGa’s promises not resonating with the public? Nehruvian legacy institutions have to die a silent death.